So You Want to Join Roc City Roller Derby! Are you intrigued by the idea of a full contact sport on roller skates? Want to join the ranks of Rochester's only women's flat track roller derby league? Great news! Roc City Roller Derby is always looking for new athletes! RCRD has rolling admission to our new skater program, Roc Quarry, for new skaters to learn the basic skating skills needed to play roller derby. For details about the next information night and how to get started, contact recruitment@rocderby.com. We're also looking for women AND men to join the officials' staff, as both skating officials (referees) and non-skating officials (NSOs)! If you have a thing for rules, consider wearing stripes and joining our own 19th Wardens squad of officials. 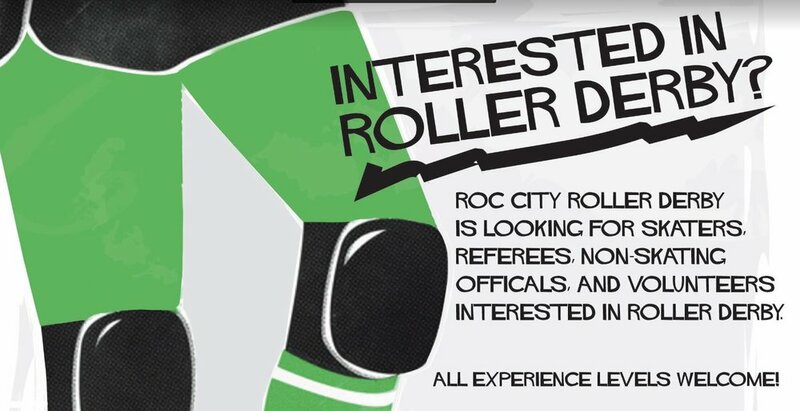 Email officiating@rocderby.com to find out more information about training to be an official. Not interested in skating, but still want to be a part of the action? We've got a place for you, too! RCRD is always looking for volunteers. RCRD is run not only by our skaters and NSOs, but also by the dedicated volunteers who work hard to bring the sport to Rochester. If you want to be a part of this, just put "I want to volunteer" in the subject when you e-mail recruitment@rocderby.com and we'll be in touch!